Music has always played an important role in Latino culture. It’s the common thread that keeps people connected to their homeland. In the case of Selena, a popular singer from Texas, it was a thread that helped her connect with her Mexican father even though she didn’t speak Spanish. Growing up in the 90s, I idealized Selena, whose untimely death at the age of 23 shattered the music world. She was an up-and-coming cross-over artist, but in the TexMex music scene, she was well known for many years before her fame. Selena transcended languages and cultures, as she was raised Mexican-American and could hardly speak Spanish. Yet, she sang beautifully in both languages and touched so many people through her songs – many of which are still favorites to this day. Her voice, inspiration, and cross-cultural tie-ins are still prevalent today. ABC Studios is currently developing a series loosely based on her life that speaks to the journey many musicians go through to reach fame. 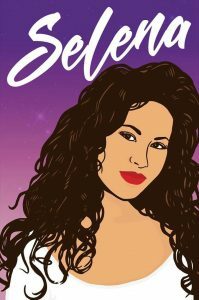 Earlier last year, MAC cosmetics launched a successful makeup line honoring the Tex-Mex star, and we finally got to see Selena get recognized with a star on the Hollywood Walk of Fame. As I think back on my childhood, my life was filled with the sound of music by artists who inspired me, like Selena. Whether it was my mother playing her favorite oldies while cooking, or my father listening to corridos as he cleaned out the garage – little did we know that these songs would create the soundtrack to our lives. Growing up in Chicago’s vibrant neighborhood of Pilsen, I was exposed to all kinds of music. The streets were filled with different styles. Grocery stores played Bidi Bidi Bom Bom. Cars would drive by blasting banda. And our home embraced the various musical influences. My mother embraces many different music styles and is a clear example of how music can transcend borders. Her playlist was far from the stereotypical Latina’s playlist. She often listened to the Beatles, Carole King and every oldie that you can think of. My father, on the other hand, stuck to his Mexican roots and filled our home with traditional corridos. Yet both of their musical influences have shaped my taste in artists. This is also the case with many English-language artists that have affected people around the world. The death of Dolores O’Riordan, the lead singer of The Cranberries – an Irish rock band – touched people across the world. In Mexico, artists were heartbroken to hear of her passing. Even though we speak different languages, the feeling is still there and her voice was so unique that you could feel the music through her voice. But no matter the language, music has a profound effect on everyone. As humans, we all share the need to feel comfort, feel love, feel sadness, feel happiness, feel anger. And that’s exactly what music does. In my father’s case, corridos made him feel a sense of nostalgia, taking him back to his hometown of Nuevo Leon, Mexico. In my case, Selena’s music brings me joy as it takes me back to my childhood. As multicultural marketers, we know that music is a major cultural cue for reaching Latino audiences. No matter the situation, music allows us to be spiritually present in another place whether it’s a moment in time, remembering loved ones who are miles away, those who may not be with us in life anymore, or simply feel something that wasn’t there before. Angelica Ramirez is an Assistant Account Executive at FCG. « It’s Paddy, Not Patty!